I once was what you are, and what I am, you also will be. POITOU, FRANCE – We came back to France to celebrate the Toussaint with friends and family. All Saints’ Day is still an important holiday in France. People go to church in the morning, clean the graves of their relatives in the afternoon, and put pots of chrysanthemums on the sepulchers. We will do the same. One of our aunts is buried in the local churchyard. She came with us when we moved to France 25 years ago. She greatly admired the French and always wanted to live in France. Alas, time didn’t wait. She was already in her eighties when we arrived and had previously had a stroke. We doubt that she fully enjoyed it here… She died a few years later. Experts have predicted that bitcoin would replace the dollar, but we’re far from that point. 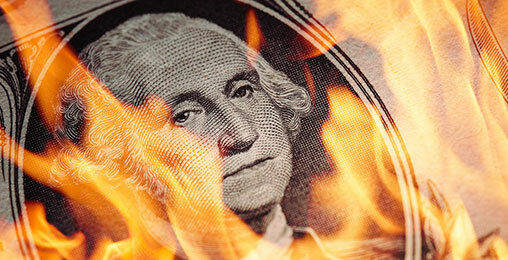 Everyone who has ever predicted the U.S. dollar’s demise has been DEAD WRONG. Passing through Paris yesterday, we found the city unusually grim. It was raining. Maybe the weather affected our mood. But the bars and cafes looked worn and sad. And the sidewalks were littered with slippery leaves. A blind man made his way, walking in front of us. He had his route well-mapped-out in his mind and swung his white stick from side to side, getting his bearings… and warning others to watch out for him. But the whole area around Montparnasse is under construction. The familiar landmarks are boarded up. After a few seconds of watching him, we realized he was lost. He was about to step off the curb into the traffic. We took his arm and guided him across. “I’m okay now,” he said, and turned towards the train station. But he wasn’t okay. There were too many obstacles – cables running across the sidewalk… plywood sealing off side streets and entryways… and makeshift steps leading into the station. “It’s all changed around here,” we said as we took his arm again, guiding him around a temporary enclosure. With that, he detached himself, thanked us, and headed toward a turnstile, where a young woman in uniform seemed to take charge of him. Are you ready to tap the largest communications project the world has ever seen? While nothing is certain, early pioneers in this arena have enjoyed rises with peaks of 8,900%… 17,000%… and even 62,000% during the first wave. This morning, down in the countryside, it is cold and overcast. The warm summer that once was is no more. We will use this occasion to give a memento mori of our own. “What’s changed?” we asked our part-time caretaker, Damien. He threw it back at us, giving himself time to compose an answer. “Well… nothing. Our little town is just the same. Nothing ever changes. Except that people are getting older. Jean-Pierre now can’t walk at all. He was able to get around on crutches until a few weeks ago. Now, he’s in a wheelchair all the time. His legs have swollen up. We were getting an update on our old friends. The news was not good. “I guess that is the way we’re all going,” said Damien gloomily. We had the same thought. “Tout passe, tout casse…” as the French say. Everything breaks down and goes away. Mountains, men, and markets. But not all at the same rate. Mountains take millions of years to flatten. Man has a shelf life, too – as it says in the Bible, of “three score and ten” (we are hoping to do a bit better)… And as for markets, it depends. Looking at the long sweep of the stock market, as measured in real money – gold – we see only four major tops and three major bottoms over the last 100 years. Math whizzes will quickly realize what is missing – another bottom. Every “I am” must be followed by “I was,” and every major top must be followed by a major bottom. Or else, the whole balance of life will be out of kilter. Will Nikola Tesla finally get his revenge? They laughed at his idea of cheap, wireless energy. But investors aren’t laughing anymore. There have been two major power shifts in American history. Now, a new type of energy is taking over. 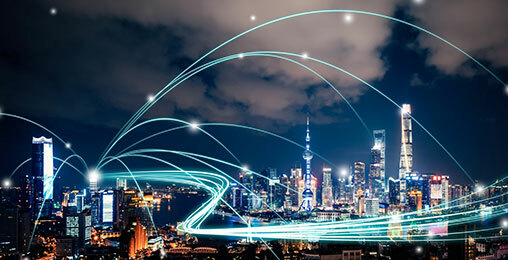 Many believe it will lead to an “internet of energy.” A virtual power grid that will make saving and using energy as simple as sending an email. This investing expert is predicting it will fuel America’s Third Power Shift. The first major top in stocks, as measured by the Dow compared to gold, came in August 1929. Thereafter, the stock market died… losing 90% of its value, in gold terms, over the next four years. The next top came a full generation later, in January 1966. And then, just when the stock market seemed at the peak of good health, it fell desperately ill… and drooped and dropped over the following 14 years, wiping out 95% of its previous value – again, in terms of gold. It took another 19 years for the stock market to fully recover and post a new high – in October 1999. This was the third – and greatest – high of the 20th century, when it took 40 ounces of gold to buy all the Dow stocks. As usual, commentators proclaimed a “new era.” Thanks to the Information Revolution, they said, this was a stock market that might live forever. But it was not early in the stock market’s lifecycle. It was late. It had already become what it was… Now, it was ready to fulfill its destiny… by dying. By the end of 1999, stocks had already begun to sink. Over the next 11 years, they fell, hitting a bottom in September 2011 – with an 85% loss. Stocks soared and are now at another major top – not as high as in 1999, when compared to gold, but higher than in 1929 and close to the 1966 top. Could stocks go higher? Yes, of course… Every nursing home has a few old codgers who have surprised the doctors and dismayed the heirs. Trends tend to go on longer than you expect… and then fall harder and faster than you thought possible. Who imagined in 1929 – at the peak of the Roaring Twenties – that a Great Depression was coming? Who foresaw – at the height of the 1960s prosperity – that we would soon be waiting 33 years for stocks to recover? What sage forecaster knew that the fabulous “Information Age” technology would be a bust? And today… just in case… we leave you with a warning: What those crashes and depressions were, so will this bubble become. 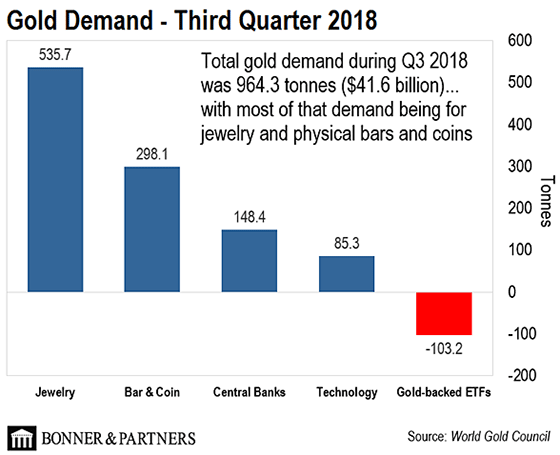 That’s the story of today’s chart, which breaks down Q3 2018 gold demand by category – Jewelry, Bar & Coin, Central Banks, Technology, and Gold-Backed ETFs. This data comes from the World Gold Council’s quarterly report on gold demand trends. As you can see, total gold demand during the third quarter was 964.3 tonnes – equating to $41.6 billion at today’s price. And most of that demand was for jewelry and physical bars and coins. Demand for jewelry was 535.7 tonnes – $23 billion at today’s price. That’s a 6% year-over-year increase from Q3 2017. Demand for physical bars and coins was 298.1 tonnes, or $12.9 billion at today’s price. That represents a 28% year-over-year increase. Central banks bought 148.4 tonnes of gold, equating to $6.4 billion and a 22% year-over-year increase. Technology demand – gold used in electronics – was 85.3 tonnes, equating to $3.7 billion. That’s a 1% increase over Q3 2017. Finally, the one area where we saw gold demand fall this quarter was gold-backed ETFs. Gold-backed ETFs keep gold on hand that is proportional to assets under management. When investors buy shares of an ETF, the ETF is supposed to buy physical gold in proportion. And when investors liquidate shares, the ETF is supposed to sell gold proportionately. Gold ETFs shed 103.2 tonnes of gold during the third quarter – $4.5 billion worth – suggesting that investors were getting out of these ETFs. This is the first time we’ve seen quarterly outflows from gold ETFs since Q4 2016… And North America accounted for 73% of those outflows as investors focused on rising equities. The big takeaway here is that falling demand for gold-backed ETFs does not necessarily mean that gold is falling out of favor. Demand for physical gold far exceeds demand for gold ETFs. And because you largely can’t sell jewelry, gold bars, and gold coins with the click of a button, investors who buy these assets tend to hoard them. As Bill outlined above, that might turn out to be a wise decision. The smartphone in your pocket will soon be obsolete. In its place will be a piece of sci-fi tech right off the movie screen. 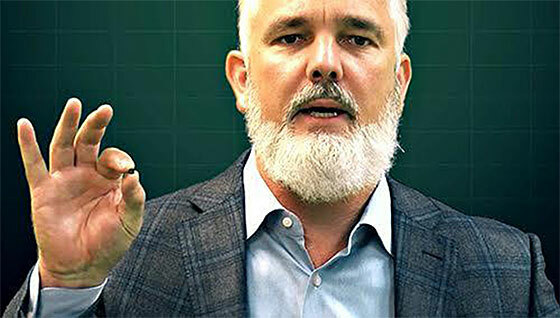 Jeff Brown, Bill’s top technologist, shows why the future of consumer electronics will be smartphone-free. Bill, I think you hit the nail on the head at the end of your letter. At this time, valuations and the age of the bull market are more important than macro factors such as debt and interest rates in predicting market direction. It amazes me that after the second-longest bull market in history, and with valuations such as price/sales still at record levels, investors are in denial about the possibility of an imminent bear market. I think it is most likely that we are in a position similar to 2000 – i.e., the market will correct by at least 50%, albeit with violent bull rallies along the way, and the S&P 500 will be lower in 10 years than it is today, as it was in 2010 after the 2000 peak. Many of us are convinced the debt mentality in our country is akin to the hard-luck taxpayer who finally wants a bite of the big apple before he dies; any means justify the end. Unfortunately, the difference is Uncle Sam won’t be forgotten by the rest of the world when his number is up. And it is not getting any better. Is this not madness? We are constantly reminded that we should, at all costs, respect the office. Only in private did most of my family and friends disrespect President Obama. If you want to broaden your listening base, I suggest you show our president the same respect. After saying all that, I believe the midterms will be the main barometer for the economy and the market. Both, I believe, are still two very separate animals. How can anyone demand more respect from YOU for our president when he has shown the entire world that he has no respect for anyone or anything, especially the office in which he was elected to serve? He is the most reprehensible man to ever hold the office, and cares for NOTHING but what the office can do for him personally, ESPECIALLY if it helps line his pockets with even more ill-gotten gains. I’ve followed this man for YEARS, and he has proven time and time again that he is a liar and a charlatan who will stop at nothing to get what he wants. That kind of personal ethic doesn’t work in government and seldom works in private business – something we will all see if his tax returns are ever released. He’s been laundering money for everyone from the mob to Russian oligarchs through his real estate deals. And his attempts to hide his fraudulent campaign and totally corrupt presidency will not stand the test of time. If there is ANY justice left in America, he will have to pay the price for that corruption with a perp walk and a nice, long prison sentence. However, the GOP has so successfully stacked the courts, I doubt “we, the people” will ever see any true measure of justice in this country for a long, long time… if ever again. I will go to my grave hating that man for the lifetime of damage he has done to innocent people, not the least of which he has done to this country. I can’t wait to see the day when all of his misguided cult followers realize what a ride he has taken them on. I have been amused by some of your readers’ demands for more respect in referring to elected politicians, apparently from the president to the local dogcatcher. As I remember, Mr. Trump once had great pride in his moniker, The Donald. Perhaps “His Majesty” or “The Magnificent and Mighty DJT” is now appropriate. Respect is accorded to men whose character demonstrates honesty and honor. By that definition, there is not a single politician in Washington (alas, in the entire nation) who qualifies for respect. There, in a nondescript town, are the headquarters of a tiny company. Almost no one has heard of this business. Many of the town’s residents don’t even know the company is there. But the technology being developed by this American company is revolutionary. It will help usher in the biggest tech breakthrough of the decade. And Jeff expects its stock to return more than 10X in the next few years.